Review: In 2006-7 a group of investors anticipated the housing and credit bubble collapse in the US. While researching they discovered how flawed and corrupt the market is. This is a very complicated story and needs a lot of attention to understand what is going on. In this film they talk about three types of mortgage bonds. They are subprime mortgage bond, mortage-backed security and then collateralised debt obligations. This is a good example of some of the terminology that was used and was hard to follow and understand. I did find this rather too long for what it needed to be. 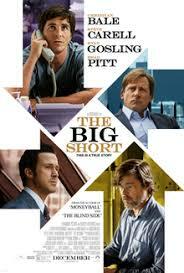 It is a grim black comedy about impending financial Armageddon. I enjoyed all the performances by the actors. Christian Bale met with the real Dr. Michael Burry. Afterwards he asked to have Burry’s cargo shorts and T-shirt, which he then wore in the movie. This did remind me of the film Margin Call, 2011. At the Academy Awards in 2016 this won one Oscar for Best Writing, Adapted Screenplay. Also at the Bafta Awards in 2016 this won Best Adapted Screenplay.